The current crisis has changed the priorities of employees. The world is changing so fast and the only thing you can be sure of is yourself. So people want to know who they are and what they want. People are less interested in money, a great company car or a fancy office. Finding pleasure, fulfilment and meaning at work is getting more and more important. Happiness at work focuses on all those three aspects (see figure 1). Employees are looking for organizations who understand and support their own happiness at work. If you want to attract or keep your talented people happiness is where you should start. 2. Employees perform better when they are happier at work! Research shows that people who experience positive feelings find it easier to think. On the other hand. Strong negative feelings (unhappiness) leads to narrow mindedness, dogmatism, unhealthy competition and distrust. Research (by the United Nations in 2013) shows that happy employees are more productive, creative and innovative. They are more co-operative and increase the likelihood of sales and profits throughout the organization. Happiness protects against stress at the workplace and decreases the level of absenteeism. Happiness at work is not only attractive for the individual but makes sense from an organizational perspective. Job satisfaction has been an important variable over the last 20 years. But it is becoming less so. On the other hand happiness at work is becoming a fast growing trend. Why is that? There seems to be no relationship between satisfaction and productivity at work. Research shows that there is a strong relationship between happiness at work and productivity. Satisfaction is passive. With satisfaction you are fulfilled (by others). You don’t want anything any more. When you talk about happiness at work you talk about being full of energy, engaged and committed. All important factors for productivity. More and more organizations realize this and stop measuring job satisfaction and start measuring (and facilitating) happiness at work. In 1999 I started giving weekly leadership training to employees and managers from different organizations. If, in a group of 12 participants, one or two participants were working for a company in reorganization it would have been quite remarkable. Nowadays it is the other way around. Organizations not in reorganization are the exception. Our company now confirms this rule. For the first time since the founding of Van Harte & Lingsma we have to say farewell to a number of highly respected colleagues. What is a healthy way of dealing with such a reorganization? I notice that it often produces extra levels of stress. The first question arising is whether you are allowed to stay. Soon after you find out you’ve survived another question arises, “How do we proceed?” Fewer people are left, but often with the same amount or even more work. You have to do more with fewer people. It is a familiar theme, perhaps you recognize it in your own organization? How do you deal with such the new situation after reorganization? 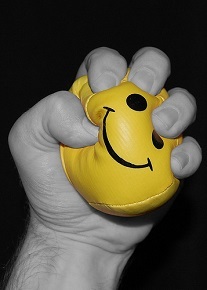 Are you stressed because of the extra work and increased uncertainty? It is common sense that too much stress is unhealthy but how much can we take? The psychologist Kelly McGonical has done some work on the subject. Maybe we’re you are ready for another perspective on stress? Research by McGonical shows: stress is not unhealthy in itself. Even when stress gets very intense, you are able to minimize its negative impact. What is important is how we deal with stress. According to her three things can help with to cope better and more healthily with stress. Create meaning. During reorganizations actions are taken that often seem nonsensical and strengthen a sense of futility. By focusing too much on what you cannot influence, your attention only enhances these feelings of futility. Try to create meaning (once more) in your work, wherever possible. Why did you start to do this work in the first place? What were your motivations? See if you can strengthen a sense of meaning in your work. Increase your sense of influence. The feeling of powerlessness is, according to McGonical, the sickening part of stress. Her research shows that vasoconstriction occurs only with people who feel stress is bad for them. People who do not have such an idea, aren’t bothered by the physical effects. Try to find whatever helps you to have a sense of influence on your own stress. For one person, this means doing yoga, another might be a strong believer in breathing exercises, practicing mindfulness or exercising regularly in the gym. So try to let go of the idea that stress is inherently bad for you. It appears to be, that this specific belief is the main cause for harmful effects. It might sound strange, because you already have enough on your plate during a reorganization. However, caring for others in stressful situations proves, specifically for the ones that do care, to have a strong protective effect. Research shows that in major stressful situations – such as financial problems or a family crisis – the risk of dying goes up by 30 percent. The striking thing about McGonical’s research, is that the negative effect of stress is completely absent for people who actively provide care to others. One of the best ways to be healthier in dealing with stress from reorganizations is to help others. In that way, you’re doing something useful. You only need to shift your beliefs for a moment and forget that stress is bad for you. Perhaps this story helped? Have a look at the inspiring TED story shared by Kelly McGonical herself. And enjoy it! How did this story help you? Or do you have other ideas on how to deal with stress during reorganizations? Feel free to share your ideas below. How do you take good care of your employees without losing sight of the results and profitability of the business? To answer this question researchers have been investigating the connection between satisfaction and productivity for ages. Often it is hard to find a correlation. Sometimes you find one but the connection is really weak. Traditionally many organizations keep focusing on job satisfaction. The classical stance is that the organization (or the unions) should take care of your job satisfaction. This fits very well with the old world. Everybody has his or her own fixed position within the organization. The world is moving slowly and is mainly static and organized bottom down. The dynamics of the current situation require a very different perspective. Change is the only constant. So this means continuing adaptation from both employees and the organization. This also fits a different way of looking at work. Employees will become more responsible and need to lead themselves much more. So a new range of competences is needed. People need to know and direct themselves much more. Skills that are not always learned at college or university. This change also creates different needs with employees. They want to know themselves much better. Be aware of their strengths and passions. So they can direct themselves much better. That is one of the reasons why organizations focus more on employee happiness. Why should they do that? Research shows that happy employees differ a lot from their unhappy colleagues. Happiness at work is all about taking initiative. With job satisfaction the organization or the boss is often held responsible. With happiness at work the employees own responsibility is the starting point. The organization can facilitate this by supporting pro activity and self leadership. Happiness at work is more about personality and the personal. General changes within the organizational structure or culture are important but this is always seen from the perspective of the individual employee. E.g. some employees really thrive on lots of freedom while others prefer much more direction and steering. Research shows that happiness at work has a clear positive correlation with productivity. This is not (or less) present with job satisfaction. 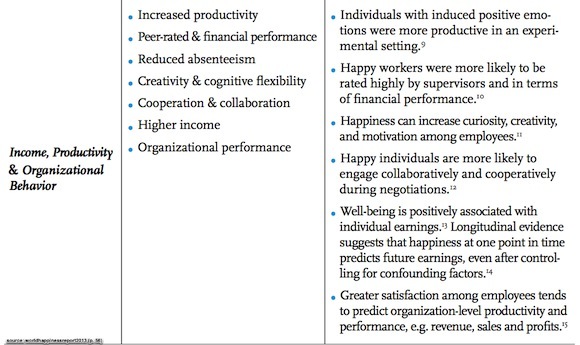 Happiness at work is also a concept where there is a consistent progressive correlation with productivity (the happier you are at work the more productive you are). Some people associate happiness at work with positive thinking, always smiling and everything should be fun. This is absolutely not the case. To put it more strongly. Research by Fredrickson shows that forced positivity (think about the ever smiling stewards on airlines) can lead to a strong increase in stress and unhappiness at work. Happiness at work is (mostly) an internal job. Its about how you feel and how you evaluate your own happiness (at work). Hard work, helping others, using your talents to the max and trying something difficult are all activities they might increase your happiness at work but certainly not always bring about a smile or generate laughter. How to start working with happiness at work in your organisation? One of the first things to do is to start talking about happiness at work with your colleagues, managers or employees. Does the idea of “happiness at work” relates to their way of thinking and does it fit with their interests and needs? When this first step has been taken you are ready to dive a little deeper. How happy are they at work? A quick happiness at work scan can facilitate this. Sometimes it is advisable to start 1 to 1 conversations to introduce the subject to staff. Talking about happiness at work is different from talking than talking about performance, commitment or sick leave. People should feel free and safe to talk about happiness at work. And you can’t force people get involved with their happiness at work. But if the other is willing to take a look at this subject the impact on the individual, the team and organisation can be immense (is my experience). People taking up their own leadership concerning happiness at work and an organisation facilitating this can become a positive spiral which generates a lot of positive energy. Enjoy the journey!